There are many reasons to love Ladybugs. This little red beetle started as a legend during the middle ages. European farmers, about 1000AD, struggles with insects that would eat and destroy their crops. At the first sign of crop damage, farmers would pray to the Virgin Mary for help. Ladybugs came and ate the harmful insects and the farmers named these answers to prayer as “Our Lady’s beetles”; this eventually became ladybugs. Since the 1800’s farmers have been raising ladybugs domestically to control pests on their organic farms. Ladybugs are most active during the warm days of spring and well into fall. They primarily eat aphids but also prey on scale, mealybugs, spider mites and thrip. They are ferocious eaters – eating as many as 5,000 aphids in their lifetime. Keep the Cool – The cool weather mid-week has been perfect for releasing ladybugs in the garden. Ladybugs have wings and like to use them. You will need to slow them down long enough to find your gardens attractive. When you get home with your ladybugs, leave the cup sealed and place them in the refrigerator or cool space (35-40 degrees). Being cool calms ladybugs down. Keep them refrigerated until you’re ready to release them that evening. Release them at night – plan to release ladybugs in your garden at the base of a plant just as dusk arrives in the evening. If you have a plant with a particular aphid problem open the cup at the base of that plant. 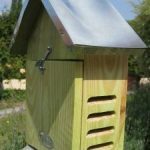 This will give them the night to settle in, find food and realize that your garden is a great place to live! Grandfathers only! Get your kids involved! 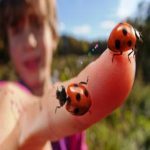 Plan ahead and allow your granddaughters to dress up as ladybugs before releasing actual ladybugs into the garden. I guarantee this is a memory your daughters will not forget. I find the mask even works for sons under 6 years old. Here’s an inexpensive outfit found on Amazon. 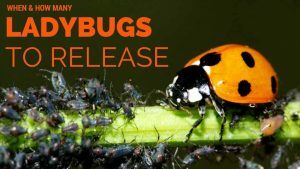 Kids especially have fun releasing ladybugs and this is a great way to teach them about environmental responsibility. You will find ladybugs stick around and kids will find them all season long. Stop in and pick up a cup of ladybugs, take them home and have fun enjoying nature this spring. Fresh ladybugs just arrived at Watters Garden Center, I’ll be helping customers at the bug counter until next week’s issue. April 14 @ 9:30 am Garden Advice that Works in the Mountains – Ready to start your garden but want a little extra help? This class will take an in-depth look at how to be successful when planting your garden paradise. We’ll discuss techniques for brighter, more beautiful gardens, and how to keep them healthy. Learn how to troubleshoot and combat problems like poor soil conditions, pests, and diseases that can frustrate any gardener whether a master or a novice. Bring your notepad!